And so, in his characteristic manner, President Obama appointed a man with serious integrity issues to be on the board of an institution that deals daily with attacks on its veracity by forces looking to denigrate and deny the memory of the Holocaust. President Barack Obama appointed White House deputy national security adviser Ben Rhodes to a post on the US Holocaust Memorial Museum’s council, the White House Reported Tuesday. Rhodes was probed by Congress over revelations that he served in his sensitive position as the president’s most trusted advisor despite the fact that he had not qualified for security clearances based on FBI background checks in 2008. Rhodes, the son of an Episcopalian father from Texas and a Jewish mother, has been attacked by Jewish groups and media outlets over his role in selling the Iran nuclear to the American public. Rhodes admitted to misleading reporters regarding the actual timeline of US negotiations with Iran, saying he used young, inexperienced reporters to create an “echo chamber” in order to sway public opinion (and Democrats on the Hill) in favor of the deal. And so, in his characteristic manner, President Obama appointed a man with serious integrity issues to be on the board of an institution that deals daily with attacks on it veracity by forces looking to denigrate and deny the memory of the Holocaust. Rhodes’ appointment to the Holocaust museum’s council could raise eyebrows in the Jewish community, which has clashed with Rhodes and the White House over the administration’s outreach to Iran and push to secure the contested nuclear agreement. Or, as Obama put it in a statement: “I am proud that such experienced and committed individuals have agreed to serve the American people in these important roles. 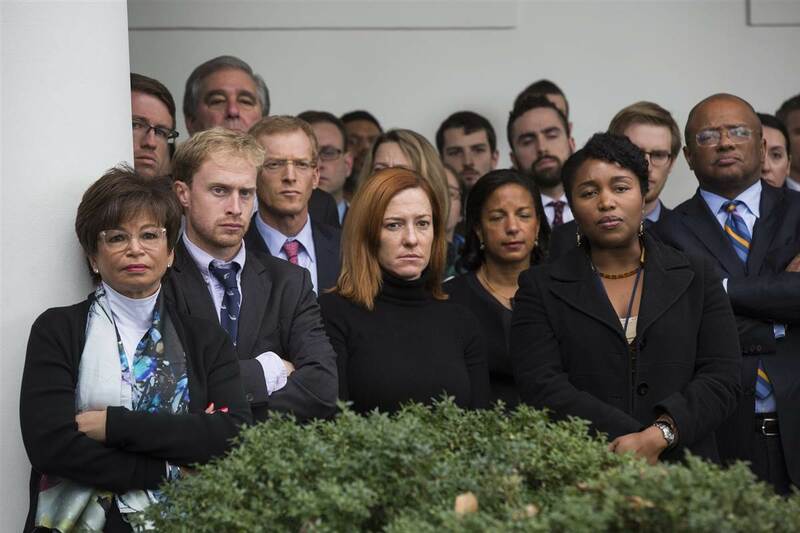 I know they will serve the American people well.” He was referring, besides Rhodes, to Valerie Jarrett and Susan Rice whom the president pawned off on the John F. Kennedy Center for the Performing Arts’ Board of Trustees. The Sept. 25 event also is being co-sponsored by the Rockefeller Brothers Fund, a philanthropic group that has been criticized for funding anti-Israel activities and organizations that support boycotts of the Jewish state. The fund bankrolls some of the leading backers of the global BDS movement against Israel, which has raised concerns among some that the administration is breaking its promises to oppose this movement. The senior White House official who bragged about creating a pro-Iran “echo chamber” to mislead Americans about last summer’s nuclear agreement is scheduled to keynote a conference sponsored by an organization that has long been accused of acting as a pro-Tehran lobbying front. 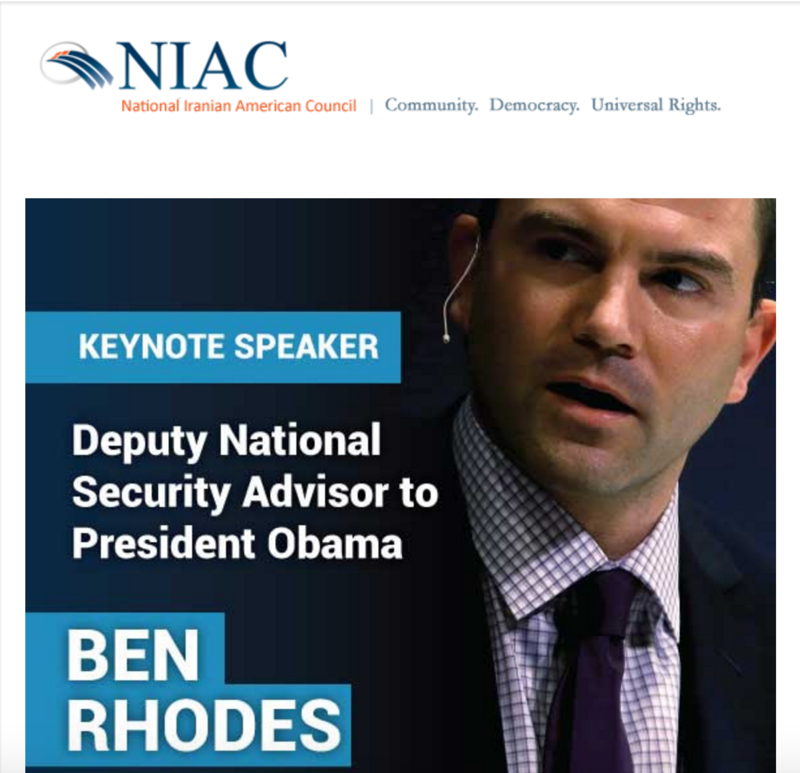 Ben Rhodes, a top national security adviser to President Obama, is slated to be the keynote speaker at an upcoming gathering hosted by the National Iranian American Council, or NIAC, which played a key role in bolstering the nuclear agreement and has long operated under suspicion that it acts as Tehran’s lobbying shop. Rhodes has been engulfed in a growing scandal following the revelation that he enlisted a roster of journalists and experts to spin the public in favor of the deal. Outside organizations such as NIAC and the Ploughshares Fund, which is co-sponsoring the upcoming conference, were cited as key parts of the White House’s effort to mislead the public about the deal. The NIAC conference also will be attended by Rep. Jared Huffman (D., Calif.), an Iran deal backer, according to an invitation for the event circulated by NIAC. NIAC makes note of Rhodes’ efforts to deepen diplomacy with the Islamic Republic in its invitation. The event’s top billed sponsors include Ploughshares and the Rockefeller Brothers Fund. Ploughshares funded writers and organizations in order to create a network of Iran deal “validators” who could influence public opinion at the White House’s behest. Most recently, the Washington Free Beacon disclosed that a Washington Post contributor who touted the administration’s $400 million payment to Iran had been funded by Ploughshares. Neither the Post nor the writer disclosed this fact. Ploughshares also moved money to National Public Radio to influence its coverage of the Iran deal. The Blob includes “editors and reporters at The New York Times, The Washington Post, The New Yorker,” etc. It also encompasses, according to Rhodes, Obama’s former secretary of state Hillary Clinton, and the administration’s first defense secretary Robert Gates. Presumably Leon Panetta, former Pentagon chief and CIA director, who goes on the record to criticize Rhodes and the president, is also part of the Blob, alongside “other Iraq-war promoters from both parties who now whine incessantly about the collapse of the American security order in Europe and the Middle East.” In other words, the emotion driving the administration’s foreign policy is contempt—contempt for allies, colleagues, and the generations of American policymakers who built the post-WWII international order, ensuring relative global stability, and peace and prosperity at home. Samuels’s profile is an amazing piece of writing about the Holden Caulfield of American foreign policy. He’s a sentimental adolescent with literary talent (Rhodes published one short story before his mother’s connections won him a job in the world of foreign policy), and high self regard, who thinks that everyone else is a phony. Those readers who found Jeffrey Goldberg’s picture of Obama in his March Atlantic profile refreshing for the president’s willingness to insult American allies publicly will be similarly cheered here by Rhodes’s boast of deceiving American citizens, lawmakers, and allies over the Iran deal. Conversely, those who believe Obama risked American interests to take a cheap shot at allies from the pedestal of the Oval Office will be appalled to see Rhodes dancing in the end zone to celebrate the well-packaged misdirections and even lies—what Rhodes and others call a “narrative”—that won Obama his signature foreign policy initiative. Rhodes is a storyteller who uses a writer’s tools to advance an agenda that is packaged as politics but is often quite personal. He is adept at constructing overarching plotlines with heroes and villains, their conflicts and motivations supported by flurries of carefully chosen adjectives, quotations and leaks from named and unnamed senior officials. He is the master shaper and retailer of Obama’s foreign-policy narratives, at a time when the killer wave of social media has washed away the sand castles of the traditional press. It’s not clear whether or not Panetta supported the deal, but he admits he was wrong about Obama’s willingness to take all measures to stop Iran from getting a bomb. So that’s it. For the last seven years the American public has been living through a postmodern narrative crafted by an extremely gifted and unspeakably cynical political operative whose job is to wage digital information campaigns designed to dismantle a several-decade old security architecture while lying about the nature of the Iranian regime. No wonder Americans feel less safe—they are.